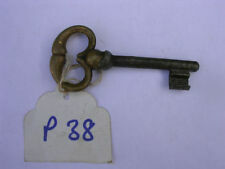 You are bidding on a LOVELY lot of 15 Antique French Skeleton Keys! These lovely keys are made from steel / iron(?) measure around 4", or just shy - they lovely antique condition with a beautiful shabby aged rusty patina- incredibly decorative and displayable! Some of the key barrels have the most AMAZING profiles - check out the pictures! Please study photos to see all the lovely details- they are a lovely set, and an absolute must have for any collector and those with a lovely house in which to display them!! HAPPY BIDDING! I have lots of keys that I will be listing - happy to combine postage where weight limits allow! SET U. Mixed lot of sizes up to approx. These were found in a garage sale in France. You are bidding on a LOVELY set of 7 Ornate Antique French Buffet Wardrobe Type Keys, with gilded tops - stunning!! These lovely keys are made from steel / iron(?) measure between 4 1/2" and 2 1/8". They are in lovely antique condition with a beautiful aged patina and wonderfully detailed tops, including a german/prussian double eagle crest - they are incredibly decorative and displayable! Please study photos to see all the lovely details- they are a lovely lot, and an absolute must have for any collector and those with a lovely house in which to display them!! HAPPY BIDDING! I have lots of keys that I will be listing - happy to combine postage where weight limits allow!. You are bidding on a LOVELY set of 4 Ornate Antique French Buffet Wardrobe Type Keys, with excellent detailed tops - stunning!! These lovely keys are made from steel / iron(?) measure between 2 7/8" and 1 7/8". They are in lovely vintage condition with wonderfully detailed tops - they are incredibly decorative and displayable! Please study photos to see all the lovely details- they are a lovely lot, and an absolute must have for any collector and those with a lovely house in which to display them!! HAPPY BIDDING! I have lots of keys that I will be listing - happy to combine postage where weight limits allow!. 7 - 10cm long. I have two lots of these for sale. You will receive a selection of 60 from those shown in the photos. These were found in a garage sale in France. Also sold in sets of 3 - we have a quantity so let us know if you need lots. General Notes. You are bidding on a LOVELY lot of 26 Vintage French Round Bow Top Keys! These lovely keys are made from steel / iron(? ), with the smallest measuring 2 1/2" and the largest you can see measuring just under 4". They are in nice vintage condition with a variety of aged patinas - incredibly decorative and displayable! They are a mixture of solid and hollow barrelled, and they all have a round bow top - check out the pictures! Please study photos to see all the lovely details- they are a lovely set, and an absolute must have for any collector and those with a lovely house in which to display them!! HAPPY BIDDING! I have lots of keys that I will be listing - happy to combine postage where weight limits allow! SET Q. We have a quantity of these, so let us know if you need lots. General Notes. You are bidding on a LOVELY lot of 32 Vintage/Antique French Keys! These lovely keys are made from steel / iron(? ), with the smallest measuring just 7/8" and the largest you can see measuring 3 & 1/2". They are in nice vintage condition with a beautiful aged patina- incredibly decorative and displayable! They are all largely hollow barrelled, if that makes sense - check out the pictures! Please study photos to see all the lovely details- they are a lovely set, and an absolute must have for any collector and those with a lovely house in which to display them!! HAPPY BIDDING! I have lots of keys that I will be listing - happy to combine postage where weight limits allow!. You are bidding on a LOVELY set of 9 vintage Deco French Cabinet Type Keys!! These lovely keys are made from steel / iron(?) the largest measures 2 6/8". They are in lovely vintage condition with wonderfully Art Deco inspired detailed tops - some are incredibly decorative and displayable! Please study photos to see all the lovely details- they are a lovely lot, and an absolute must have for any collector and those with a lovely house in which to display them!! HAPPY BIDDING! I have lots of keys that I will be listing - happy to combine postage where weight limits allow!. You are bidding on a LOVELY Vintage French unusual 4 Way Bit Key, with excellent detailed shaft, made by Bricard, Paris circa 1930s/40s - stunning!! This lovely key is made from steel / iron(?) and measures 2 1/2". It's in lovely vintage condition with a wonderfully detailed bit that has a cross shaped profile - It's incredibly decorative and displayable! The serial number on the reverse is 341392112323 - I'm sure someone has a directory somewhere that would pinpoint it's original use/lock location. Please study photos to see all the lovely details - an absolute must have for any collector and those with a lovely house in which to display it!! HAPPY BIDDING! I have lots of keys that I will be listing - happy to combine postage where weight limits allow!. Lot of 5 or 6 large antique French wrought iron keys. Dating to the 18th and early 19th centuries and with solid stems. In good antique condition. I have four lots of these keys for sale. You will receive ONE lot. Three (3) different French specialist security keys. Clean - No rust. Antique casket/chest key with additional internal barrel. Clean and ready to display - No rust. 83.2mm. 26.3g. Large Antique Solid Cast Iron Key - Circa 1865. NB: The bow / handle is cracked on one side of the main shaft (see photo), the cast iron can be repaired. This does not detract from its intrinsic value in anyway. ~ Antique French Iron Key from the late 1800s ~. Large iron key with heart shaped top. Rare Antique Iron French Key Old Unique Collectible. 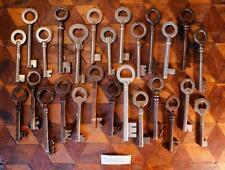 French key, door key, castle, rustic, lock and forged. Great Table Top Decor Or wall décor. Must be Key of a very tricky lock. We Are Here To Resolve Your Every possible Problem And Leave A Positive Smile On Your Face. Rare Antique Iron French Big Size Key Old Indian Unique Collectible. Great Table Top Decor Or wall décor. 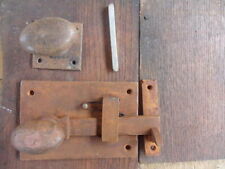 French keys, door key, castle, rustic, lock and forged. Must be Key of a very tricky lock. Indian Rare Unique Collectible French Key Set Of 2 Great Table Top Décor. Rare Antique Iron French Big Size 2 Keys Old Indian Unique Collectible. 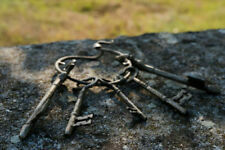 French keys, door key, castle, rustic, lock, and forged.